Adrian Steirn, an acclaimed wildlife and portrait photographer, has been accorded the status of ‘Photographer-in-Residence’ at WWF South Africa. Steirn’s photographic skills and expertise will be utilised to document and showcase WWF South Africa’s conservation programmes and achievements through photography and cinematography. The residency will contribute to the vital legacy and archive of WWF’s conservation work. “Adrian has a wonderful passion for our continent and her people. 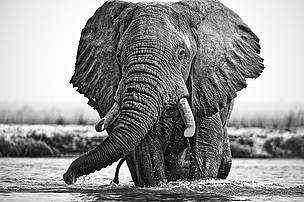 His photographic expertise has the power to capture moments in time for generations to come,” explains Morné du Plessis, CEO of WWF South Africa. According to Du Plessis, Steirn’s photography and cinematography will not only be used by the organisation to illustrate conservation work, but also in fundraising ventures. “The planet is everybody’s responsibility. I believe that we all need to use our particular resources and talents to do what we can to contribute to conserving it,” says Steirn. Based in Cape Town, Steirn has earned numerous awards for his work. Most recently he was named overall winner of the Africa Photographic Awards 2010. The status of ‘Photographer-in-Residence’ at WWF South Africa has been accorded to Steirn for 3 years. A sample of Adrian Steirn's wildlife photography.